The Brazilian company has come up with a similar type of tech that they have called NearBytes. The new NFC technology like system that has been created by Kinetics has been called NearBytes and it has already made its way into a handful of different apps for smartphone users to download. A NearBytes software development kit (SDK) has also been released for global developers. The SDK is meant to help NearBytes, which is regularly compared to the use of NFC technology, to be easily integrated into the applications and systems of developers. Like the Dhwani tech from Microsoft, this new type of tech uses sound waves in order to be able to transmit data from one device to another. Microsoft recently revealed its own tech that is similar to NFC technology, which is called Dhwani. Kinetics has developed a different, but similar type of tech that is like NFC technology but that is also similar to Dhwani through its use of sound waves. It uses short sound codes that are generated by the apps in order to make it possible to exchange data between two enabled devices. Unlike NFC technology, however, NearBytes does not require the device to be equipped with any kind of special chip. This makes it possible for virtually any kind of smartphone to use this form of data transfer without having to ensure that any specific dedicated hardware is present. In the case of near field communication, a special chip is required, in addition to dedicated tags or sensors in order to make it possible for an exchange of data. 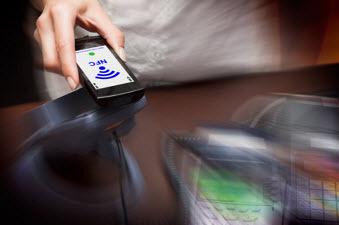 Among the growing number of apps that are using this alternative to NFC technology, there are two that have stood out. The first is BizzBuzz and the second is called The Candle. Both use the tech to make sure that devices can communicate with each other regardless of what hardware they contain. BizzBuzz is the more complex of the two, offering an exchange of professional and/or personal information between two devices, while The candle allows two smartphone users to share a simple digital flame – a type of greeting or hello.